Use the Dentek Scaler and Pick to get that "fresh from the dentist" feeling. The Dental Pick and Scaler includes a pick, a scaler and a handy long-handled mirror for your convenience. The scaler that comes included with this dental cleaning tool set removes plaque, tartar and stains to help you keep your teeth white. The pick will easily remove annoying food particles from between your teeth. 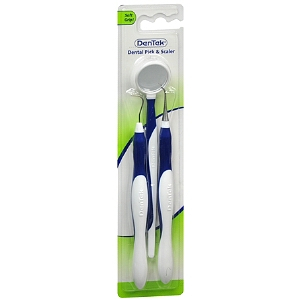 The mirror included with Dentek Pick and Scaler will help you with cleaning the hard-to-see areas of your mouth. This 3-piece set of dental cleaning tools helps clean your teeth regularly, reducing the chances of yellowing and tooth decay.